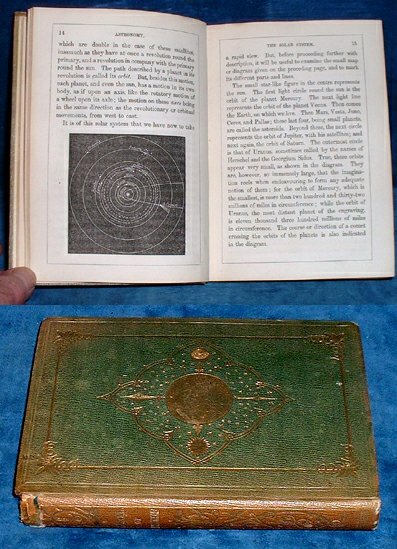 Title: THE ELEMENTS OF ASTRONOMY Adapted for the Study of Youth. Description: London, John Knedrick 1850 Engraved frontis by G. Sterling W.H. Mole (pinx.) + many text woodcuts + many large pictorial, foliated or grotesque initials. . 170x120mm (in 8's) green gilt pictorial cloth with globe, sun, moon & stars. Spine floral gilt (head of spine damaged for 1cm/spine and edges gilt) All Edges Gilt. Frontis +Titlepage +dedication with Prince of Wales feathers crown and motto +218pp +pp Chauntler's works +tipped in pp smaller format Kendrick book list. All text within ruled borders, engraved Grammar School prize label dated 1850 on pastedown. A neat nice copy in the pretty original binding.